In a wide expanse of space, gravity drew dust and gas together to create the young solar system. The sun formed first from the vast material, with the planets close behind. But how did a sea of swirling particles become the brightest star in our sky? Although it may look empty, space is filled with gas and dust. Most of the material was hydrogen and helium, but some of it was made up of leftover remnants from the violent deaths of stars. Waves of energy travelling through space pressed clouds of such particles closer together, and gravity causes them to collapse in on themselves. As the material drew together, gravity caused it to spin. The spin caused the cloud to flatten into a disk like a pancake. In the center, the material clumped together to form a protostar that would eventually become the sun. About one million Earths could fit inside the sun. The young protostar was a ball of hydrogen and helium not yet powered by fusion. Over the course of about fifty million years, the temperature (18 million Fahrenheit )and pressure of the material inside increased, jumpstarting the fusion of hydrogen that drives the sun today. The formation of the sun didn't take up all of the cloud it was born from. What was left continued to orbit the star, while planets formed from the leftover material. The sun is an average-size star, not too big and not to small. Its size makes it an excellent star to orbit, as it is neither large and fast-burning nor small and dim. Several million years from now, the hydrogen inside of the sun will run out, and the star will swell up into a red giant with a radius extending to Earth's orbit. The helium at its core will also be consumed. The star will never be hot enough to burn the oxygen and carbon that are left behind, so the sun will fizzle out and become a white dwarf. The sun is the closest star to Earth, at a mean distance from our planet of 149.60 million kilometers (92.96 million miles). This distance is known as an astronomical unit (abbreviated AU), and sets the scale for measuring distances all across the solar system. The sun, a huge sphere of mostly ionized gas, supports life on Earth. The connection and interactions between the sun and Earth drive the seasons, ocean currents, weather and climate. About one million Earths could fit inside the sun. It is held together by gravitational attraction, producing immense pressure and temperature at its core. 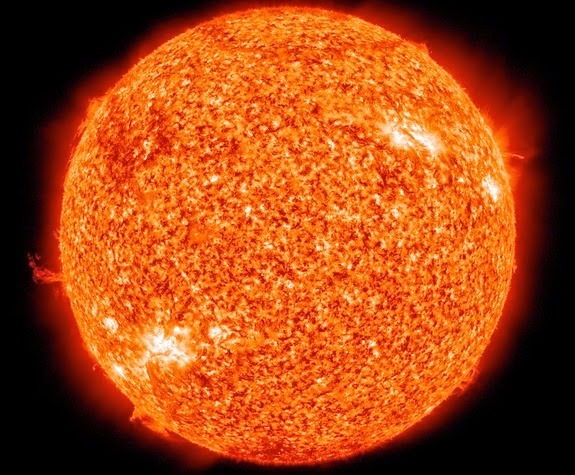 The sun has six regions - the core, the radiative zone, and the convective zone in the interior; the visible surface (the photosphere); the chromosphere; and the outermost region, the corona. The sun has no solid surface. At the core, the temperature is about 15 million degrees Celsius (about 27 million degrees Fahrenheit), which is sufficient to sustain thermonuclear fusion. The energy produced in the core powers the sun and produces essentially all the heat and light we receive on Earth. Energy from the core is carried outward by radiation, which bounces around the radiative zone, taking about 170,000 years to get from the core to the convective zone. The temperature drops below 2 million degrees Celsius (3.5 million degrees Fahrenheit) in the convective zone, where large bubbles of hot plasma (a soup of ionized atoms) move upwards. The sun's surface - the photosphere - is a 500-kilometer-thick (300-mile-thick) region, from which most of the sun's radiation escapes outward and is detected as the sunlight we observe here on Earth about eight minutes after it leaves the Sun. Sunspots in the photosphere are areas with strong magnetic fields that are cooler, and thus darker, than the surrounding region. Sunspot numbers fluctuate every 11 years as part of the sun's magnetic activity cycle. Also connected to this cycle are bright solar flares and huge coronal mass ejections that blast off the sun. The temperature of the photosphere is about 5,500 degrees Celsius (10,000 degrees Fahrenheit). Above the photosphere lie the tenuous chromosphere and the corona (crown). Visible light from these top regions is usually too weak to be seen against the brighter photosphere, but during total solar eclipses, when the Moon covers the photosphere, the chromosphere can be seen as a red rim around the sun while the corona forms a beautiful white crown with plasma streaming outward, forming the points of the crown. Above the photosphere, temperature increases with altitude, reaching as high as 2 million degrees Celsius (3.5 million degrees Fahrenheit). The source of coronal heating has been a scientific mystery for more than 50 years. Likely solutions emerged from observations by the Solar and Heliospheric Observatory (SOHO) and the Transition Region and Coronal Explorer (TRACE) missions, but the complete answer still evades scientists. Recent missions - Hinode, Solar Terrestrial Relations Observatory (STEREO), and the Solar Dynamics Observatory (SDO) - greatly improved our knowledge of the corona, getting us still closer to the answer. They also give us an unprecedented understanding of the physics of space weather phenomena such as solar flares, coronal mass ejections, and solar energetic particles. Space weather can adversely affect our technology in space and on Earth; these missions help us to develop space weather reports. By using the gravity in one of the tube inside the spaceport to compress hydrogen and helium particle close enough and ignite them with laser, it is possible to start the fusion reaction like the sun.